Team Laura Jean in Clean Up Australia Day! Unfortunately, we see far too much litter on school grounds and not enough recycling options. 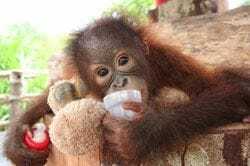 Palm Oil (saturated fat - labelled vegetable oil) must become sustainable to get the adorable Orangutan and their friends OFF the critically endangered list!